Mono no aware (物の哀れ) is a term used to describe a literary construct in Japanese story telling and represents cultural component. Mono no aware can be summarized as an awareness that things are finite, impermanent, and that while sad, this impermanence grants that thing a certain kind of dignified beautify. Uchoten Kazoku is in many ways a story about mono no aware. While Yasuburo and his family appear to have moved on past their father's unfortunate demise at the hands of humans in a nabe (hotpot stew), we begin to see that in many ways they have not. Furthermore we can see from the interactions with the Ebisu clan that tanuki society has not moved beyond the loss of their father either, as he was such a great tanuki. This lingering sadness forces all of them to examine their attachment to the deceased leader and what that loss means to them. We also meet Benten, the human who has managed to obtain the power of a tengu, able to fly through the air, and seemly her life, with ease, seeming to have little to trouble her or weigh her mind. At first she is presented as frivolous, fickle minded, and childishly cruel or even potentially wicked, introduced in an antagonistic role. This anime succeeds very early on in capturing the novel's atmosphere and pacing. Over the course of this story the use mythical creatures, magical powers, and dramatic relationships will serve principally as vehicles to explore the concept of mono no aware, exposing the beauty as well as sorrow in things that cannot last, things that cannot be said, and things that eventually must end. Well I'd say it's well written, beautifully drawn and animated, Acting is spot on. Adult humor with a touch of childish banter. The concept of humans, Tanuki, and Tengu coexisting and interacting with one another and a interesting plot inter-weaved together. I like it! This is an imaginative series that has fresh new ideas, that are executed very well. The only thing I can compare it to in terms of genre, is something between fruits basket, and FLCL. This is something you should be watching! They are well written and very delicate. I love the interactions and that the magical seems to be well woven into the story and not sticking out. A little bit of myth, mystery, love and family interplay are well balanced in the show. I could watch this over and over as there a many little details that come up with every viewing. Drawing style is simple and I like it. This is a beautiful style and a story that pulls you in and mesmerizes you. After each and every episode, it makes you wish for more. It can be funny and serious. You shouldn't be bored while watching this anime. As questions you have gained are answered, more take their place(But not in an annoying way). I highly recommend this to people of all ages. Truly enjoyable anime that leaves you with a lot to chew on after the credits roll. If you are looking for something light-hearted that feels a bit like Miyazaki's movies, this is for you. This anime is only 13 episode long and provides one of the most complete stories I have seen to date. Must watch! I began to watch this show because of wacky and clever humor. I finished it because of the intense drama and bonding of brothers that had become estranged. There is little I can say without spoiling the atmosphere, but a tale of fantasy and ridiculousness blossoms into a tender tale of tragedy and betrayal. It ends finally with a story of healing and epitome. A family reconnects after dealing with the tragedy of losing their idyllic father. Not a show to be missed, especially for the more seasoned anime connoisseur looking for a change of pace. When I first watched the PV i thought, "Oh this may be something I like!" But my friend wasn't sure about it. So i'm the only one watching it. I first thought in the start of this first ep. "This is so cute!" The art is really cute and the animation is amazing! It can be a Little childish but in a good way. Our main character is a cool, cute, weird guy who can change form in all way. a very refreshing anime to watch, well written and well animated, smooth transition between scenes, and a very well rounded vocal cast. you really get to understand the characters in the short time of the first episode. easily drawing in the viewer into they're world. 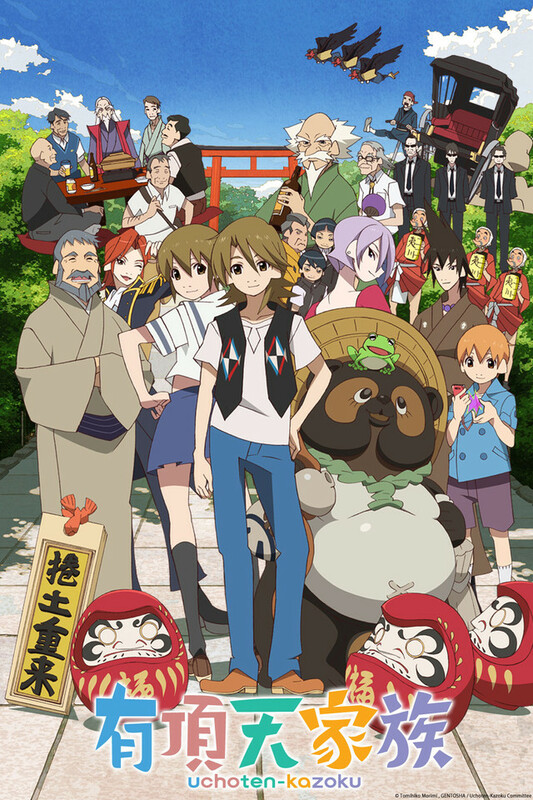 Check out the sequel, The Eccentric Family 2 here!